The phone rings; the doctor has the results. “Are you ready Amanda?” The two people Amanda Baxley loves the most had begged her not to be tested. But she had to find out. If your family carried a mutated gene that foretold brutal illness and you could find out if you inherited it, would you do it? Would you confront it, accepting whatever answer came? Or ignore it while you could? In Mercies in Disguise, acclaimed New York Times reporter and bestselling author Gina Kolata tells the story of the Baxleys, an upstanding family in small town South Carolina. Many of them were doctors, but still, they are struck down by an inscrutable illness. Finally, they discover the cause of the disease after a remarkable sequence of providential events. Meanwhile, science, progressing for 50 years along a parallel track, handed the Baxleys a question—not a cure, but a blood test that would reveal who had the gene for the disease. Science offered another dilemma—fertility specialists had created a way to spare the children. 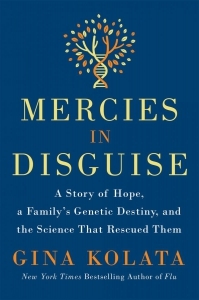 A work of narrative nonfiction in the tradition of the The Immortal Life of Henrietta Lacks, Mercies in Disguise tells the story of a family that took matters into its own hands when medicine could not help. It’s a story of a family dealing with unspeakable tragedy without being driven apart. It is the story of a young woman—Amanda Baxley—who faced the future, determined to find a way to disrupt her destiny.